Boulder Ridge in Breckenridge CO Real Estate is where you will find luxury homes close to the Breckenridge Ski Area. Located up Ski Hill Road, Boulder Ridge is the closest single family home subdivision to the base of Peak 8. There are a total of 35 lots in Boulder Ridge with 0.15-1.22 acres. Currently 9 lots are vacant with 26 homes built between 1991-current. Some of the homes and lots have ski in access and all are able to walk to the slopes. All the properties are located on the bus route as well. Cucumber Gulch is adjacent to the properties located on North Woods Lane where you can cross country ski and snowshoe in the winter and hike in the summer. Even though the luxury homes in Boulder Ridge are located so close to the base of the Breckenridge Ski Area some have views of the ski slopes. All the properties are located on city water and sewer. Boulder Ridge is in the Town of Breckenridge so any sale will be subject to the 1% transfer tax. 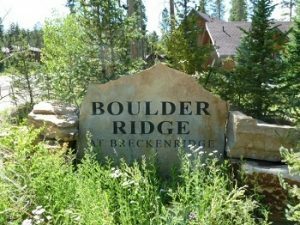 If you are looking for a luxury home for sale in Breckenridge Colorado Boulder Ridge is an area to look.